WASHINGTON --- Soldiers are about to get their hands on the Army's new Joint Light Tactical Vehicles (JLTVs), and the first unit will start receiving the trucks as the New Year begins. These deliveries keep the program right on schedule, following an Army Systems Acquisition Review Council decision last week to move forward with fielding JLTVs to the 1st Armored Brigade Combat Team, 3rd Infantry Division. The unit, located at Fort Stewart, Ga., will start receiving its own JLTVs in January 2019, and should be fully equipped with about 500 new JLTVs by the end of March 2019. "The JLTV program exemplifies the benefit of strong ties between the warfighter and acquisition communities," said Dr. Bruce Jette, the assistant secretary of the Army for Acquisition, Logistics, and Technology. "With continuous feedback from the user, our program office is able to reach the right balance of technological advancements that will provide vastly improved capability, survivability, networking power, and maneuverability." The new trucks represent a significant modernization success for the Army and Marine Corps, with the program on track to replace many venerable High Mobility Multipurpose Wheeled Vehicles (HMMWV). "I simply could not be prouder of the team that is bringing JLTV to reality," Jette continued. "Our single focus is giving Soldiers better capabilities, and our team of Soldiers, Marines, and Civilians worked tirelessly to deliver an affordable, generational leap ahead in light tactical vehicles." 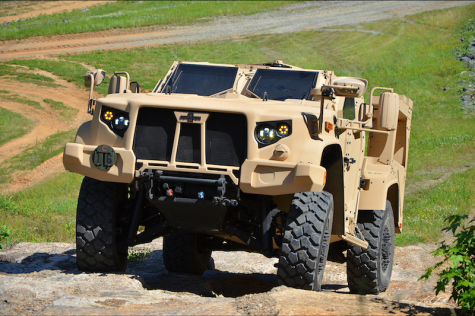 The JLTV family of vehicles is designed to restore payload and performance that were traded from light tactical vehicles to add protection in recent conflict. JLTVs will give Soldiers, Marines, and their commanders more options in a protected mobility solution that is also the first vehicle purpose-built for modern battlefield networks. "We are very excited to get these trucks into the hands of our Soldiers," said Col. Mike Adams, 1st Armored Brigade Combat Team commander. "It's an honor to be chosen as the first unit to receive such an improved capability, and I look forward to getting it into our formations." The JLTV program remains on schedule and on budget as it wraps up its low rate initial production phase, yet the program office's work is far from over. As warfighter needs change, the team will continue to explore ways to refine the design and the capability it offers. More deliveries are slated across each service in 2019. Ultimately, the Army anticipates purchasing 49,099 vehicles across its Active, Reserve, and National Guard components, and the Marine Corps more than 9,000. The JLTV will be fielded in two variants and four mission package configurations: General Purpose, Close Combat Weapons Carrier, Heavy Guns Carrier, and a Utility vehicle.